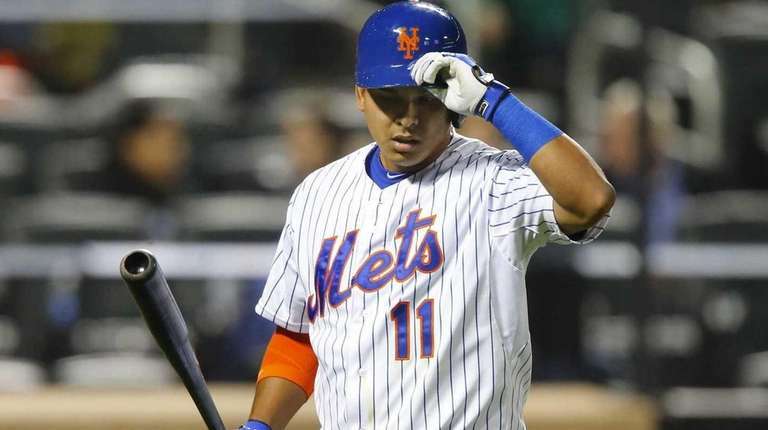 PORT ST. LUCIE, Fla. — The Mets officially released shortstop Ruben Tejada on Wednesday, a curious move that saved the club $2.5 million, though it cut into their infield depth at a time when starting shortstop Asdrubal Cabrera is questionable for Opening Day. Tejada was placed on waivers earlier in the week but went unclaimed. The Mets will pay Tejada $491,803, one-sixth of the $3 million he was awarded in arbitration. He is free to sign with any team, perhaps the Cardinals, who have a need at shortstop because of the thumb injury sustained by Jhonny Peralta. General manager Sandy Alderson acknowledged that freeing up Tejada’s salary was a part of the Mets’ decision-making, though it was just one factor among several others. Among those was building more flexibility on the roster and creating opportunities for prospects such as Matt Reynolds. Tejada, 26, was among the longest tenured members of the Mets. Last season, after he was booed on Opening Day, Tejada earned a place in franchise lore and became a sympathetic figure during the team’s run to the World Series. It took Chase Utley and a vicious takeout slide in Game 2 of the NL Division Series. The incident left Tejada with a fractured leg and a permanent place in Mets history. He ended the 2015 season hitting .261 with three homers and 28 RBIs, his defense making him the starter at shortstop entering the playoffs. Though he was regarded as an average glove at shortstop, he was arguably the best of the Mets’ choices based strictly on defense. Nevertheless, his sometimes stormy tenure with the Mets has ended in an abrupt divorce, seemingly motivated by a desire to save a few million dollars. Tejada’s release opens a spot on the Mets’ bench. Earlier this week, manager Terry Collins said his priority is on offense instead of defense. Alderson mentioned wanting a player who could play in both the infield and outfield, which would be more difficult to carry with both Tejada and Wilmer Flores on the roster. Reynolds and Eric Campbell stand in line to benefit from Tejada’s departure, with both in the mix to compete for a bench spot. Reynolds can bounce around the infield and is capable of playing short. He filled Tejada’s roster spot during the NLDS, though he did not appear in a game. At Triple-A Las Vegas last season, Reynolds, 25, hit just .267 with six homers and 65 RBIs, meager production for a hitters’ haven like the Pacific Coast League. Campbell, 28, is a right-handed hitting corner infielder, though he has also played in leftfield. In 71 games last season, Campbell hit just .197 with three homers and 19 RBIs. But the Mets value Campbell’s plate approach and believe that the quality of his at-bats will eventually translate into better results. While Tejada had his flaws — which occasionally became points of contention at various points during his Mets tenure — neither Reynolds nor Campbell can match his big league experience or track record. Still, the Mets believed they had enough choices to move on.